Throughout his entire athletic career, Rollins Stallworth has always been one to wear many hats. In high school, he was a three-sport star in basketball, football and track, and for two years, he was a two-sport athlete in football and track at Stanford as well. But after wearing so many hats all his life, he decided that only one would matter to him the most and was worth dropping everything else for: He wanted to start for the Stanford Cardinal football team. On Sept. 5 in Evanston, Illinois, four years, hundreds of grueling workouts and countless moments of tremendous uncertainty finally came to fruition: Rollins Stallworth took the field, atop the depth chart, for Stanford’s first snap against the Wildcats. Needless to say, it’s been a long journey to the top for the fifth-year senior. Coming out of high school, schools recruiting him actually wanted him to play basketball. In terms of football, as a two-star recruit, his options were limited, to say the least: Nevada had some interest, but Stallworth always had his eyes out west, at Stanford, where he would have to walk on. After he got accepted to Stanford on a partial scholarship for track and as a preferred walk-on for football, Stallworth’s mindset on the field had to drastically change from that of the stud high-school athlete as he began his slow grind to the top. Under the watchful eye of his mentors, Chris Owusu and Jeff Trojan (a walk-on himself), Stallworth was able to steadily hone his craft while watching recruited players like Ty Montgomery, Jamal-Rashad Patterson, Michael Rector, Drew Terrell and Kodi Whitfield take the field ahead of him while he continued to improve as a receiver. In fact, he thinks the walk-on experience helped improve not only his football skills, but also his life as a whole throughout his Stanford career: It made him work that much harder just to catch up to the other guys in his position group that Stanford had recruited, not to mention passing them for playing time consideration. 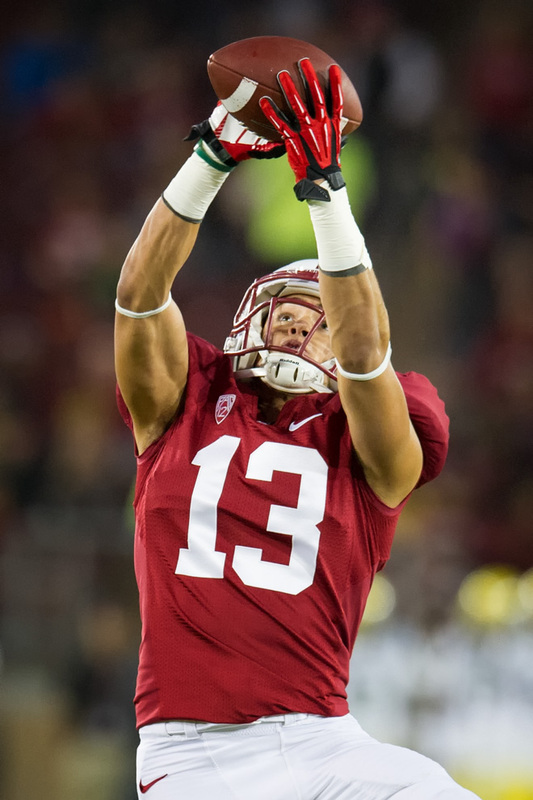 By 2013, Stallworth was Stanford’s offensive scout-team player of the year and had quit track to focus on football, essentially putting all his eggs in one basket. But with Stanford recruiting better than ever at wide receiver, drawing top talent like Francis Owusu, JJ Arcega-Whiteside and Trenton Irwin to The Farm to replenish its wideout corps, there was always the distinct possibility that despite all his hard work, there just might not be room on the field for Stallworth. Those doubts were put to rest last summer, when head coach David Shaw called Stallworth into his office and explained that the coaches loved Stallworth’s work ethic and how he approached practice, playing on special teams and showing up ready to play every day. He was getting a full scholarship. “Immediately, all the hard work, everything you’ve put into what you do and what you love finally paying off is an unbelievable feeling, and so is the urge to tell my parents, my family,” he said. And the stars finally aligned for Stallworth on that brisk September morning at Northwestern University, as a suspension to senior wide receiver Michael Rector cleared the way for Stallworth to start. The progression was complete: Rollins Stallworth, scout-team player, by way of Rollins Stallworth, fade specialist, had finally taken the last step to becoming Rollins Stallworth, starting wide receiver. Stallworth caught two passes for 17 yards that day. He’s since caught another pass for 20 yards, late in Stanford’s victory over UCF. Although he’s no longer a starter, per se, due to the returns of Rector and Devon Cajuste from suspension and injury, he’s still heavily involved in Stanford’s offensive identity and is usually the only receiver on the field for Stanford’s heavy sets — a testament to his hands and his blocking ability, perhaps. Even though it took him so long to get to where he is, there aren’t any regrets for the senior wideout, who graduated from Stanford last fall and saw his goal of starting for the Cardinal come true. And now, as one of the senior leaders on the team, he’s making sure that the younger guys that are in his shoes — freshman Jay Tyler, walk-on tight end Ben Snyder, some of the defensive backs — know to keep chipping away and ignore how tough the odds may seem, because things have a way of working themselves out.